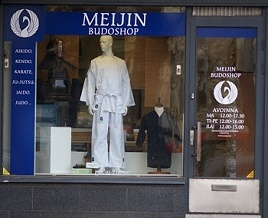 Only official Meijin Budoshop resellers can resell Meijin Budoshop products. Do you want to change your hobby to a job? Or do you need change to your life? Take your budo to the next level... apply. what do you expect from the Meijin Budoshop Reseller Program. Easy and economical expecially to club orders. Next 20kg(upto 40kg total) will take another 20EUR etc. Delivery method: delivery fee might differ from list price cause of multi dimention of products - you will get accurate delivery fee and possible discounts (not shown before) on proforma invoice. All products are delivered together. If you prefer separate delivery please make a separate order. *Star indicates that postal shipping is without insurancy in EU - customer has own insurance or customer takes the risk. All other shipments have insurance. Bogu measures: Remember to check how to measure form clerk/You know the correct measuring methods. No return/exchange policy with self measured products. Country: BelarusBelge/BelgqueBosnai/BosniaBälgarija/BulgariaCeska/TsekDanmark/DenmarkDeutschland/GermanyEesti/EstoniaEspana/SpainSuomi/FinlandFranceHellas/GreekIrelandIslandItalia/ItalyKypros/CyprosLatviaLiechtensteinLietuvaLuxembourgMagyar/HungaryMoldovaMonacoNederland/HollandNorge/NorwayPolska/PolandPortugalRomaniaRussija/Russia(Petersburg)Russija/Russia(Moscow)Slovenija/SloveniaSlovensko/SlovakSuisse/SwitzerlandSverige/SwedenTürkiye/TurkishUkrainaUnited KingdomÖsterreich/Austria if not Finland - calculates also the new delivery fee accordign to selected country. You will receive circa one informations and offers in a month. You can unscripe the list easily after each message and each message contains information how to unscripe. FOR BANK PAYMENT I like to use bank transfer and receive e-mail invoice from my order. All foreign payments in EU are without any extra charge if paid thru economical EU e-banking. All payments outside of EU will be charged with 6€ bank fee. Customer is always in charge of his/her bank fees. I like to use PayPal e-mail invoicing for my order. All foreign payments, which are not our direct e-mail proforma invoices and not paid thru economical EU e-banking, will be charged with 3% office fee to cover banking fees. We will send a proforma invoice via e-mail and after your payment we will produce and/or send the goods. Bogu assembling, wearing and packing. How do I know that my order is right size? At INFO you can find measuring guides and size charts. If you need more info about measuring or some product size chart is missing, please contact us and we will help you to make an order with right sizes. You can also fill the OTHER box on order form with a note 'choose right size with my measures' and fill all measures to the order form. How do I know if product is in stock? At online shop you can find in every produtc details if the item is in stock. With bogu we ask you to inform your size and we will check the stock, so you can make a preinquiry for bogu you like to order. After receiving the order we will always check the stock situation. If some product is missing we will inform you before sending the invoice. If the product is not in stock and must be ordered from factory there will be information sign on the product details how long is the estimated delivery time. Delivery time starts when the order payment has arrived. Some of our products are only possible to make factory order. If some product has run out of stock and there is no posibility to make an order we can only sell the product when it is in stock next time. If product has sign 'store product' you can only buy it from store or booth. How do I know if the product is available at booth, event or store? If the product is in stock usually it is also in store. There is the store name and a green ball with number (1pc, 2-5pcs or over 5pcs) in every pruduct - it is located under the price when you choose size, color etc, where you can see if the product is available in stores. If you are going to visit our store or booth you can always check by phone that the product is available. You can also ask as to bring the product to any event we visit. We try to fullfill all wishes if possible. You can always make an order at online shop or by phone. We handle all orders in 24h during work days and we will reply by e-mail or text message. We will reserve all product for you for the order. We will wait for the payment to arrive in 10 days else we will release the product from resell and cancel the order. Please notice the time for transfering the money from bank to our bank. After receiving the payment we will post the products to the shipping company - Matkahuolto(bus), Post or Courier. The shipping is atleast done every Tuesdays and Thursdays. Matkahuolto, Post or Courier will inform you by phone, text message or letter about the arrival of your shipment to local office near you. You can buy the product with cash (or card in Finland) in our stores, events or booths. You can preorder the product to any event we visit, but we will only reserve the product with prepayment. We do not charge any shipping to the events. Is the price for products same in store and events? Currently the price is same. The offers might vary debending on the event. You can buy 'store' and '2nd class' products only in stores and booths if available. Inform yourself to the mailing list and you will get all the latest information of products, offers and new products, and other news. We will post only news and info 1-2 times in a month. You can join to our mailing list by filling the request on the order form with your e-mail. We wish you to inform any other mail than gmail, because gmail does not receive our mails properly. If you only have gmail you must understand that all our mails might end up to the junk mail or be removed by filters. The order is binding by the law. We will wait for the payment arrival 10 days maximum from the date on invoice, and we will reserve the product for the duration. If you will neglect to make the payment we will cancel the order. We will notice the neglection to customer data. Returning the product is only option for stock items on orders from online shop. Only possible for customer orders with consumer rights. Does not apply to any altered products, special factory orders, hygien products, individual orders with size requirements or personalised products. Always contact us before returning any products. We give 14 days return policy for all normal price textiles in our store - ablied only to items in stock. Returned products must be unused and look like new. Meijin Budoshop is not responsible about any measuring error made by customer and presume that customer has knowledge of measuring instruction/quides. Any return cause of measuring error is on responsibility of customer and customer is in charge of any fees caused by returning and reshipping the products. If you receive a product with some error inform us immediatly. We do not replace used product broken unless there is a clear manufacturing mistake. We do not replace any damaged products caused by misuse and/or careless use. We do not replace any product which has been under maintainance or is not properly maintained before use. Durign April is many happening and 13.4. Saturday Helsinki store is closed because of Turku special kendo competition and seminar for Finnish(East) and Swedish(West) kendokas [any country kendoka are more than welcome to join if you like to join either team!]. You can get infomred about special opening hours of Turku shop during this event. During Eastern holidays Turku is closed on Friday 19.4. adn we have a booth at Lieto iaido camp. On Saturday 20.4. Helsinki store is closed because of the Eastern holidays. Also Monday 22.4. is closed because of the last day of Eastern holiday. We might reply if you make an e-mail to us, atleast fi we have time and oportunity. We will see you all in events and Gambatte for everyone! We offer this beautyful Sageo [cord for sword scabbard] all April as a product of the month. Big hit in Europe and lot of used item is best gift item for sword lovers. The length is suitable for all 2.3-2.8shaku swords. Our stores have limited color models available so please check that your favorite color option is available from the selection and store situation. The color option can be sent to another store after prepayment of the goods. We offer this Sageo 2-color as a product of the month during April with -15% discount. Can not be combined to any other offer/discount. Same price online and stores. Multiple colors in stock - if stock is not available the discount can NOT be included to any orders from Japan. A shipment of many kind of products arrived 13.12.2018. Specially we like to say about the new pair of iaido knee protectors, which are comfortable and high quality made in Japan. And also Nikken-Made in Japan-iaito 2.45 arrived to the stock. You can come and check the iaito in Helsinki store. Jo in white oak, Seppa for swords, oils and sword care sets arrived too. Come and get yours or present to your friend from Meijin Budoshop! And the SALE does continue until 22.12.2018 - PreBrexit and X-mas sale together. Welcome to shop. Does your team search the shinai model for the basic courses or perhabs to have a small stock for people to join the club to test kendo? Our new Kihon model is just what you are looking for. Kihon means Basic like Kihon Waza is Basic techniques. 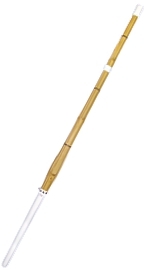 Economical option, but the bamboo is Keichiku/Katsuratake which is used in many combetition models. Kihon shinai is available only in 10 sets for start from Japan - the sizes can vary inside the order. Junior sizes can be ordered in smaller quantities with the economical price cause Meijin Budoshop is supporting junior sports. In 2019 the model will be in stock in Finland and you can make an immediat delivery orders in 10 pieces. The delivery will be only in 10 pieces until late 2018 - the delivery time from Japan is from 1 to 4 weeks depending on the season. 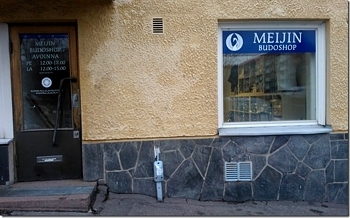 Meijin Budoshop got a deal with shipping to SWEDEN by PostNord, DENMARK by PostNord, ESTONIA by Omniva, LIETTUVA by Omniva and LATVIA by Ominiva. All packets from 1kg to 20kg is only 20.- each! Easy for clubs to make bulk orders! Please note on order sheet that you like to have items with 20.- delivery in previously mentioned countries. Card payment is possible in Turku and Helsinki stores. Mastercard, Maestro, VISA, Electron and AmericanExpress -cards also debit- and credit-payments with these cards available. Card reader in use at the events we visit like camps, competitions, etc. PayPal or bank transfer is in use with foreign payments. If we get 1000 likes we will have a lottery for handmade japanese white oak bokken! Go and like - share this and it is possibel to win this beauty with your name (in japanese ofcourse)! check more info here! Lottery will be done immediatly when 1000 likes in FB achieved! Ask an offer for your team. We give discount to 10pcs and/or 5pcs orders of uniform, shinais or wooden weapons depending on products. Size may vary with same product. We give various discounts to every order exceeding 250 euro for all order made by a team or a club. This is our new easy discount system for teams and clubs. Our Helsinki shop, we come from Turku and ran the shop by our family members twice a week. in den Geschäft/Stand möglich ist, mit Bargeld, E-Banking und Karte bezahlen. (Visa, Mastercard, American Express, Electron Karte). 3% Office Gebühr für über 200€ Zahlung mit Karte. 19.04.2019 in Lieto in TAKADA-sensei camp. Heidi Örling. Jari Lampinen: 4. Dan Kendo. Unsere geschäftlichen Hauptkriterien sind Qualitätsprodukte, Service, Ökonomie und ein hohes Fachwissen. Weight ca. 530g(39). Taiwanese(Keichiku) bamboo. 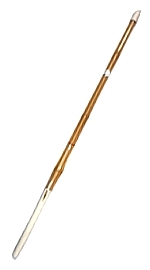 Economical basic junior shinai for practise. Including tsuba, tsubadome, leather parts and tsuru. For maintainance use shinai oil #43101 or #43105. Please check shinai shortening #110011 and Tsukagawa shortening #110010. Please select all the details from product to see the price. If price is not shown, the product will be available in future. Shipping is charged on invoice. Meijin copyright: All pictures, images and text have exclusive copyright and ownership by Meijin Budoshop FI1959572. Copying, editing or saving images, pictures or text is strickly forbidden by international laws of copyright.